Some changes occur during the painting phase when visual problems become evident. While I was working on this painting it became obvious that Mary was to close to the Gianna figure. After discussions with my client at my suggestion, we decided it would be best to reposition Mary further back into the painting. The placement of the figures worked fine in the pencil sketch but in the final painting the two figures were crowded and the sense of movement was halted. 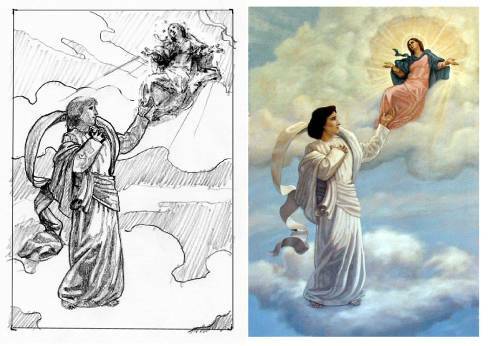 I also changed the clouds behind Mary to add drama and give a better effect of a heavenly entrance.